The 29,700 sqft. 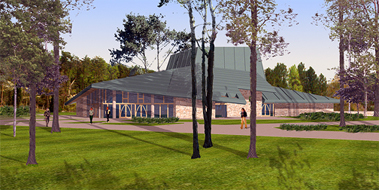 Performing Arts Center will be used for performances, cultural events, general Academy assembly, and instruction. The facility shall enable events for performances of all types, including music, dance, film, and multi-media presentations. The main level contains the lobby, an auditorium with a seating capacity of 800, stage related equipment storage, dressing and make-up rooms, and the facility director’s office and restrooms. Divided between the main and a lower level will be various classrooms for drama, dance, choir, band, as well as spaces for individual instrument practice, rehearsal, and instruction.